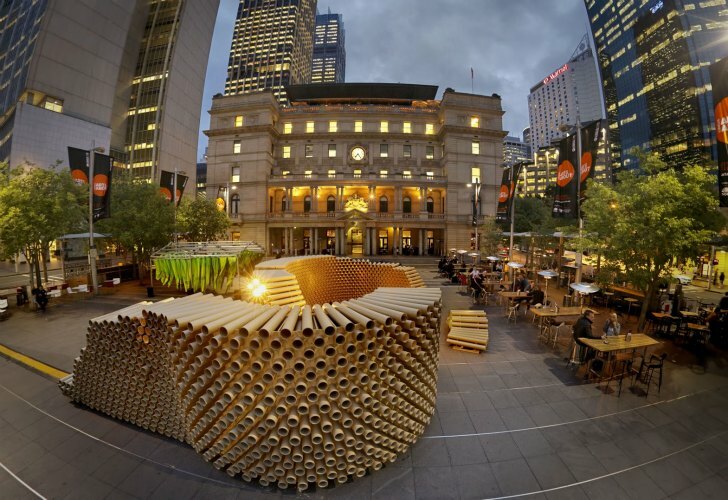 Last fall, a group of architecture students from the University of New South Wales constructed a temporary pavilion out of recycled cardboard tubes in front of the Sydney Customs House. The pavilion was one of several temporary structures constructed by architecture student groups from Australian universities as part of the CH4 Student Design Competition during the Sydney Architecture Festival. UNSW's Built Environment team was given 2,000 tubes from a company that manufacturers carpet. The goal for the competition was to make use of recycled materials and educate festival visitors on sustainability. UNSW’s Built Environment team designed, prefabricated and pre-assembled the temporary pavilion at the Tramsheds on UNSW’s Randwick campus. They used plywood sheets and cut holes in the wood to create structural forms, which the cardboard tubes would slide into. The entire pavilion sits on a small foundation of wood slats that curve in half circles to create the pavilion. After pre-assembling the pavilion in the university buildings, the students took apart the structure and rebuilt it in one day on the forecourt of the Customs House in Sydney. Queenie Tran, a third-year architecture student and one of the team leaders, said “The brief we were given by the Government Architect was to create an event space that uses renewable materials.” All of the teams for the CH4 competition worked with recycled and reused materials, like compressed aluminum cans, giant folding fabric pleats and a grid of large moving puzzle blocks. The exhibition lasted from October 20th to the 31st and was juried by a panel of Sydney architecture professionals. 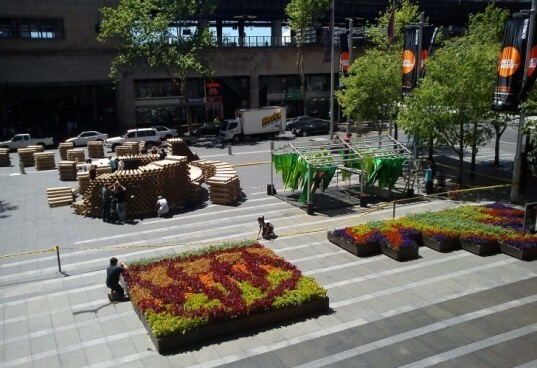 After the competition, the UNSW Built Environment students hoped to send the cardboard tubes back to the manufacturer for reuse or at minimum, the tubes would be recycled into paper. UNSW's Built Environment team designed, prefabricated and pre-assembled the temporary pavilion at the Tramsheds on UNSW’s Randwick campus. They used plywood sheets and cut holes in the wood to create structural forms, which the cardboard tubes would slide into. The entire pavilion sits on a small foundation of wood slats that curve in half circles to create the pavilion. After pre-assembling the pavilion in the university building, the students took apart the structure and rebuilt it in one day on the forecourt of the Customs House in Sydney. Queenie Tran, a third-year architecture student and one of the team leaders, said "The brief we were given by the Government Architect was to create an event space that uses renewable materials." All of the teams for the CH4 competition worked with recycled and reused materials, like compressed aluminum cans, giant folding fabric pleats and a grid of large moving puzzle blocks. A rendering of the completed temporary pavilion. The temporary pavilion sits on one corner of the forecourt of the Customs House in Sydney. The exhibition lasted from October 20th to the 31st and was juried by a panel of Sydney architecture professionals. A miniature model of the organization of the cardboard tubes and the structural members. Here the team pre-assembles the pavilion in a university building before taking it apart and assembling it in Sydney. The temporary pavilion was cleverly titled "Roll Play". After the competition, the UNSW Built Environment students hoped to send the cardboard tubes back to the manufacturer for reuse or at minimum, the tubes would be recycled into paper.